Hi friends. 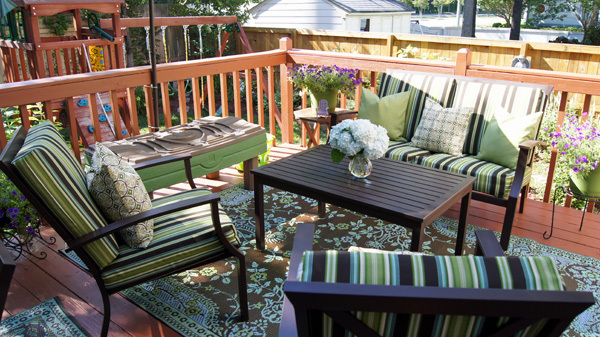 Has it warmed up enough yet in your area to start thinking about getting your outdoor spaces ready for Spring? We are almost there, I can feel it. I’ve actually been able to spend a couple of days working in my garden, but today is cold again. Some of you are lucky enough to enjoy pretty temps all year! 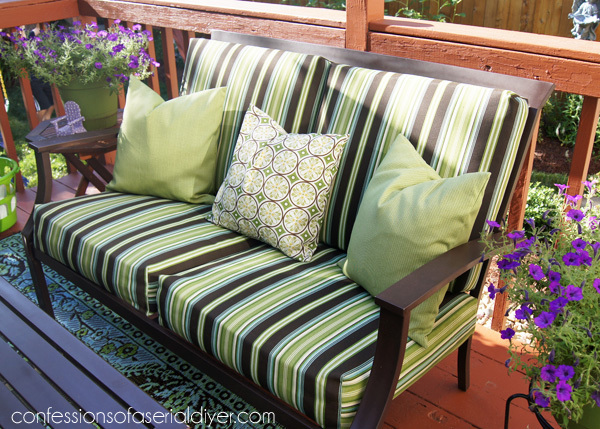 Today I am re-sharing an oldie but goodie, my Sew Easy Outdoor Cushion Cover Tutorial…perfect for this time of year. 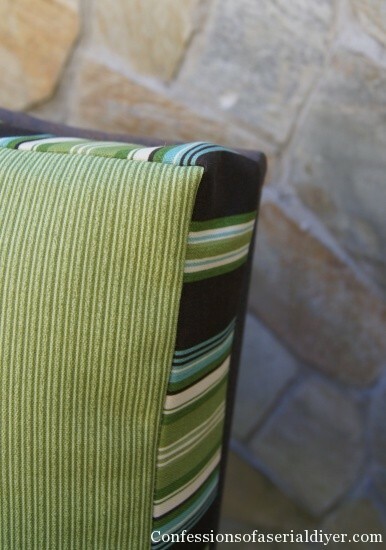 It’s so much more cost effective to recover your old cushions, and there are so many more fabrics to choose from. 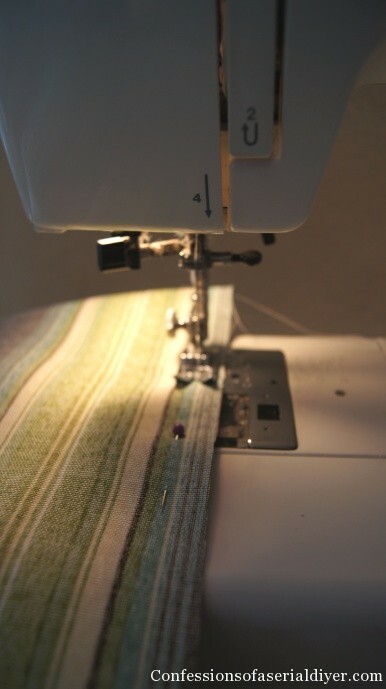 First, I’d love to share a couple of readers’ photos of their finished cushion covers. I am always so excited to hear from a reader that they were inspired by something I shared. It’s even more exciting to see pictures! Great job, Judith! 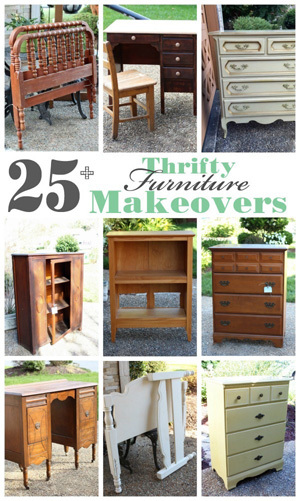 Nothing feels better than tackling a project yourself, especially if it’s saving you a lot of money! Don’t you want to sit out here with a few friends? She did an amazing job! See? 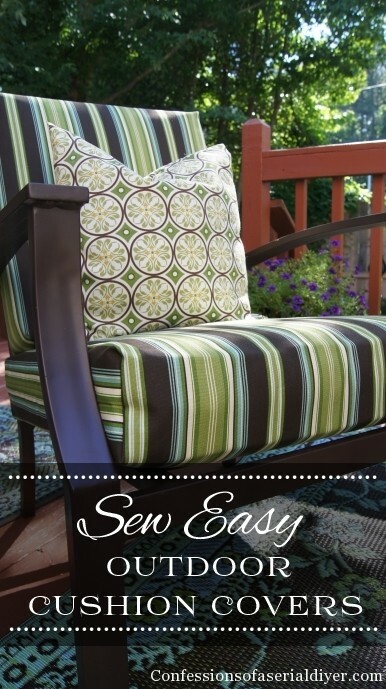 I told you these are SEW EASY! Thanks, ladies! 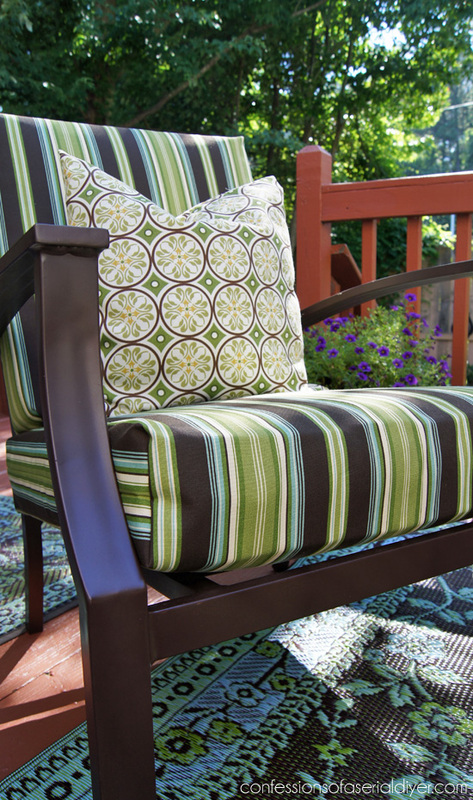 Looking to replace your outdoor cushion covers? You’ve come to the right place! 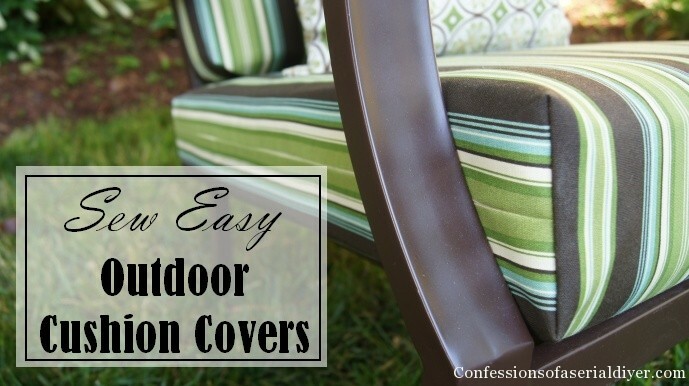 I’m going to show you step-by-step how easy it is to make new covers for those faded, time-worn, covered in bird poop and who knows what else, outdoor cushions! I purchased this set at Target years ago. It came with several pieces and the price was right. 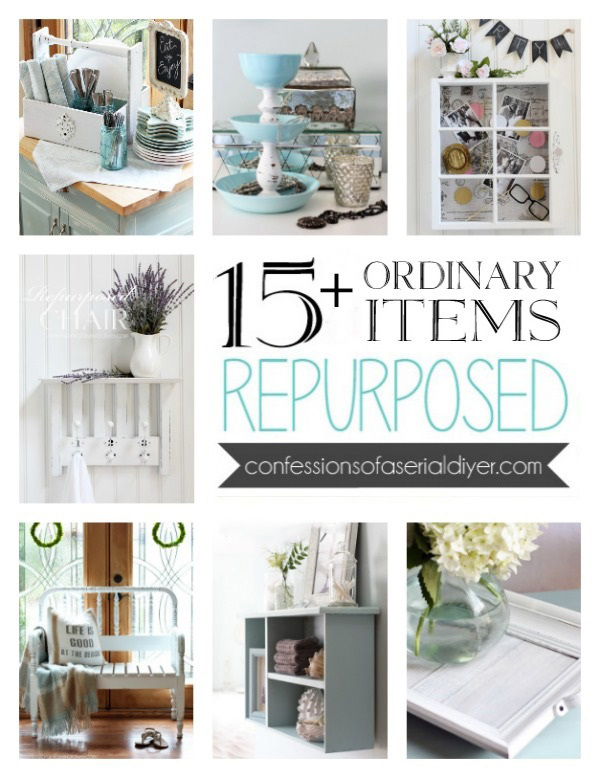 I bought it when I had an in-ground pool at my old house and needed lots of furniture to fill the space around it. 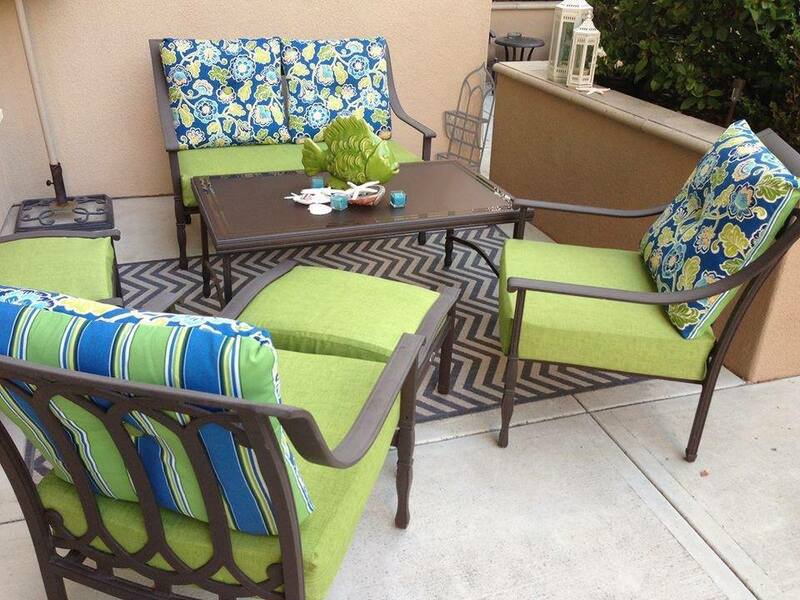 Only then it was white with light green cushions. Since then it’s had two wardrobe changes, not including this one, and a new paint job. 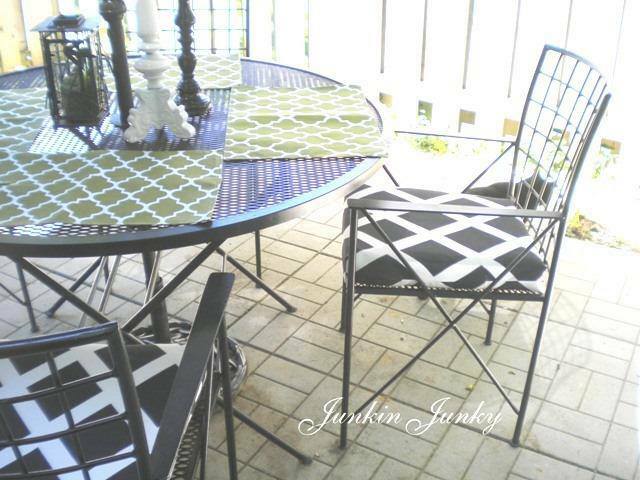 I give it another light coat of spray paint each summer to freshen it up. Maybe some day I’ll get a new set, but when it still looks this good, why bother? And the deck…gross! Not to worry though, I spent the past three days out there. (And believe me, my arms are not happy right now!) A little demo and lots of elbow grease and it’s looking so much better. How does it end up like this?? UPDATE: You can see the deck HERE now! I prefer to use stripes or something with a geometric pattern to make cutting a straight line easier. I also like to use colors that are naturally found in nature for a more cohesive look. 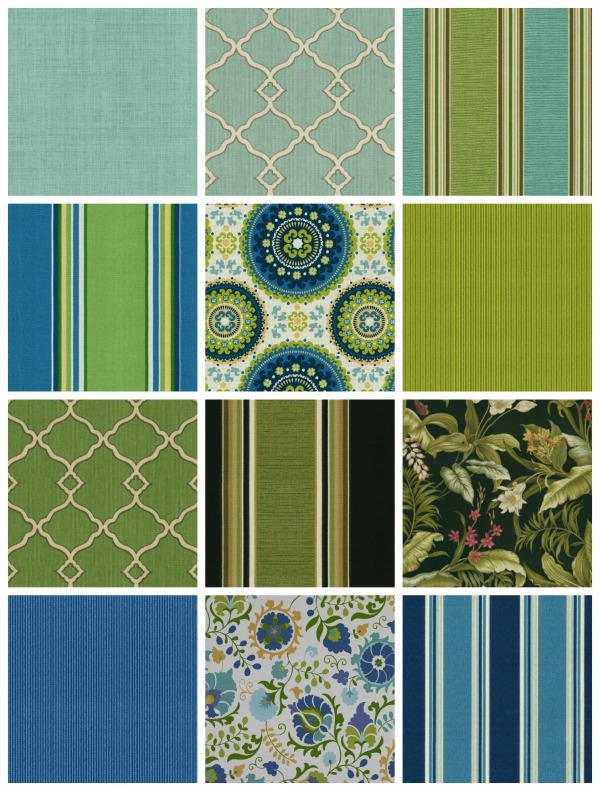 These are outdoor fabrics I found at JoAnn Fabrics. 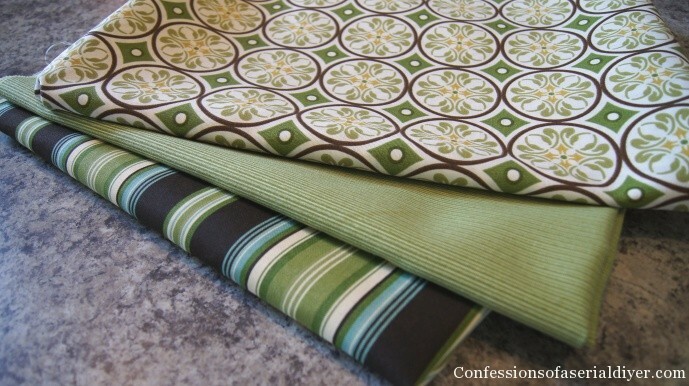 This fabric is 54″ wide. 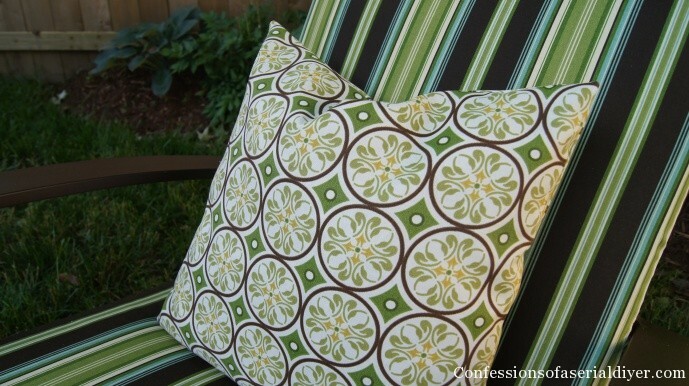 I was barely able to cut enough for two cushions side-by-side. 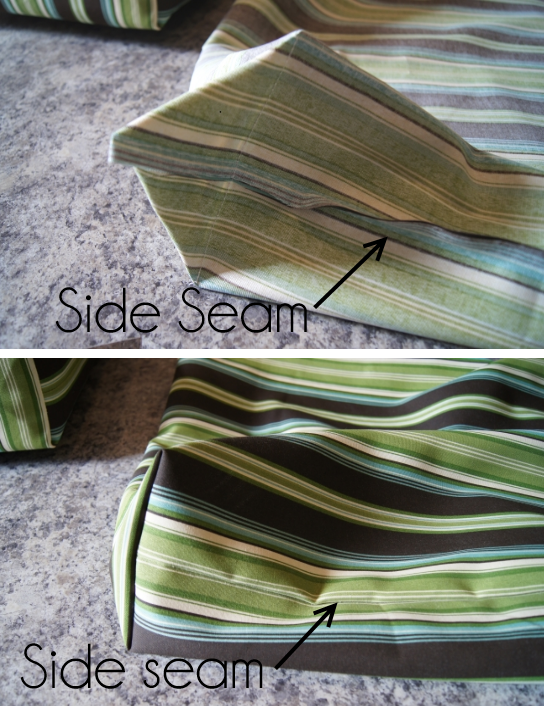 Your sides only need to be long enough to meet each other in the middle with a 1/4″ seam allowance for both top and bottom. You’ll want them snug so they lay nicely! 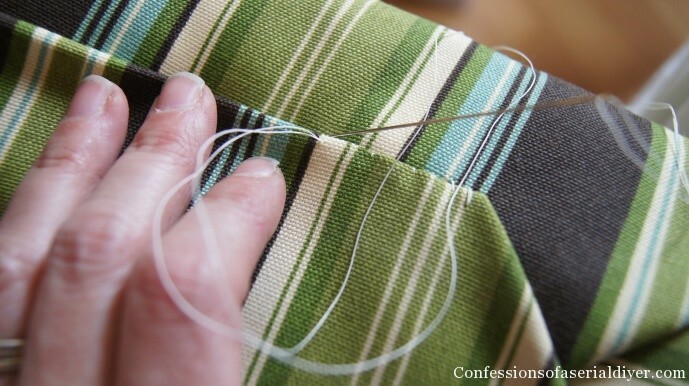 You can trim the extra fabric, but I didn’t bother. 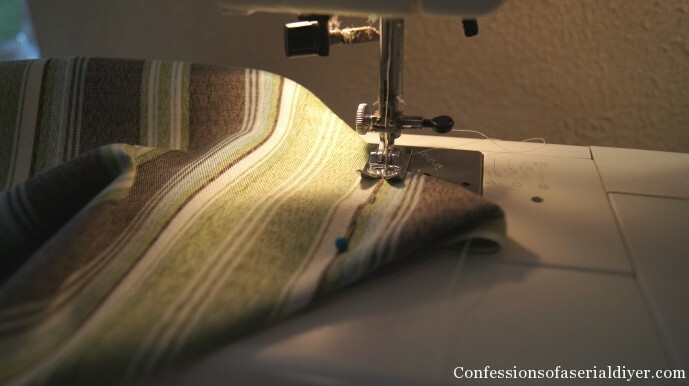 I didn’t reinforce my seams either because I don’t plan on removing them to wash them. I’ll just make new ones again when these have had it. Insert your cushion again and tada! Perfect! Just look at that beautiful corner! 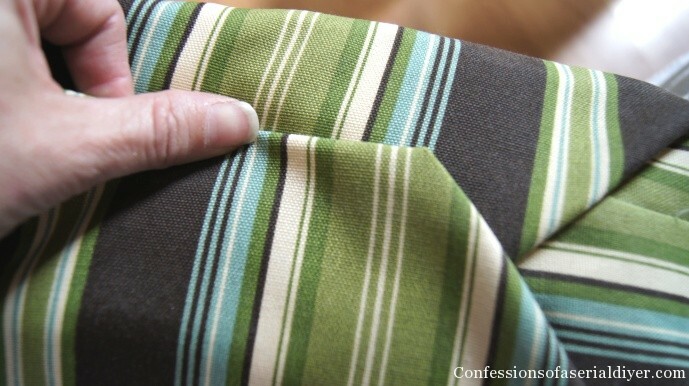 And you can barely make out the side seam because of the stripes! My assistant is texting his friends while on the job again. 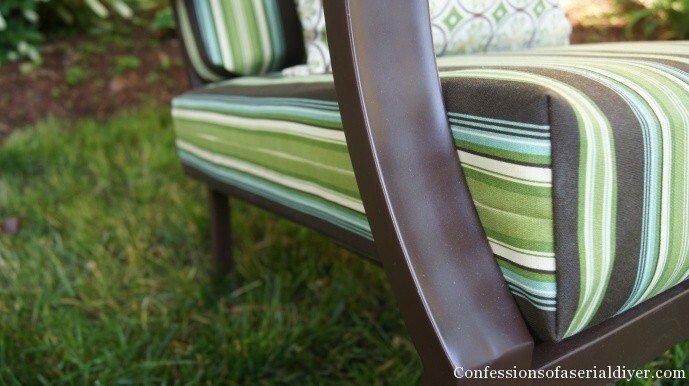 I wasn’t crazy about the stripe at first because I used a stripe last year. 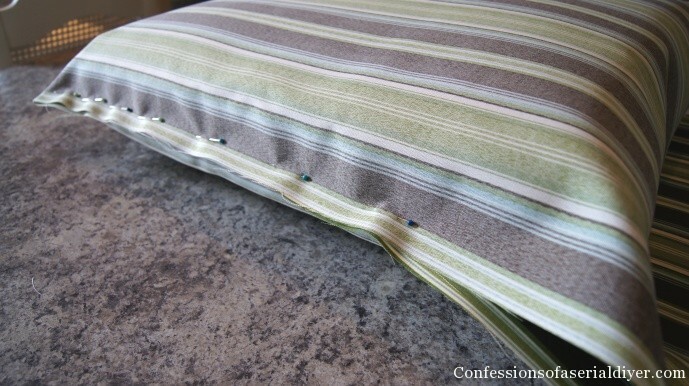 I really wanted to use the geometric fabric I used on the pillow for the cushions, but there were only two yards left on the bolt. 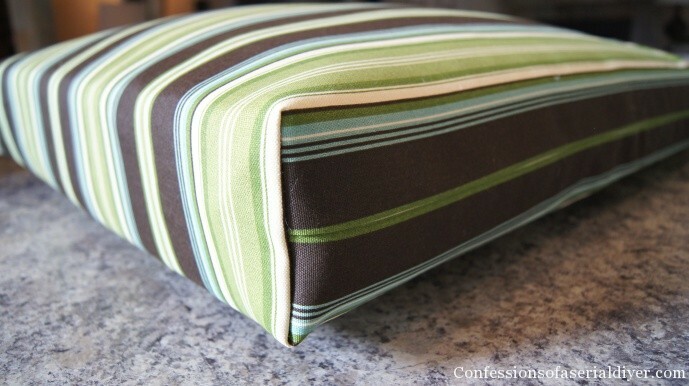 The stripe is so classic, though and it is really easy to sew with, so I’m happy with how it turned out! I stuck with the same color scheme as last year because it matches my awesome recycled plastic (what?!) 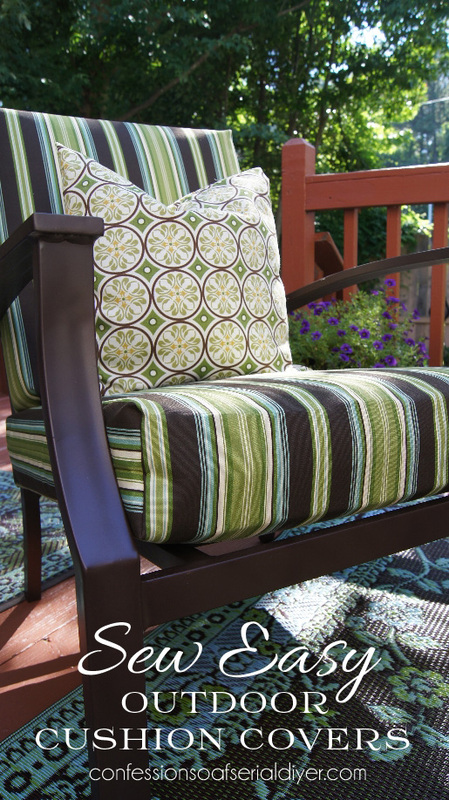 outdoor rug which I’ll share with my deck makeover. It took me almost eight yards to cover all the cushions. That includes a total of eight cushions. 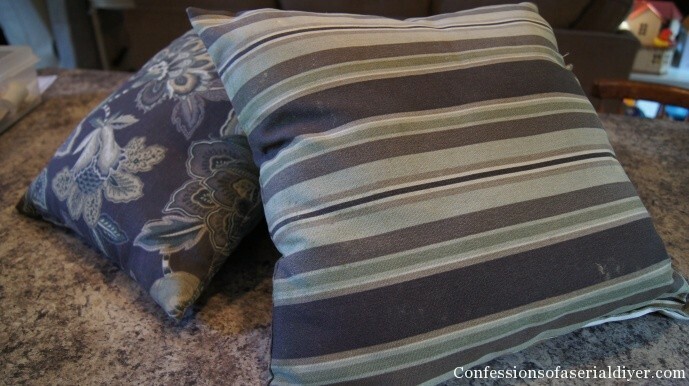 That’s approximately one yard (54″ wide) per cushion, but I was able to cut two side-by-side in my fabric. These are quite thick so you should be able to do the same. I’m sharing those in a separate post here. Hopefully you are feeling inspired! That was a great tutorial! I think I’ll tackle my outdoor bar stools soon….the hot sun and the birds have really worked them over the last few summers. Thanks! Thank you so very much for sharing this tutorial. 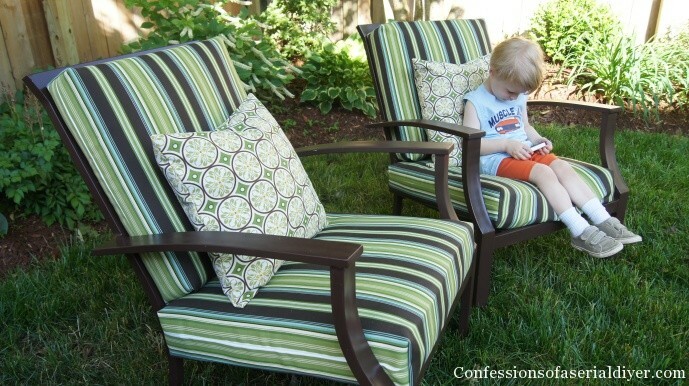 I really need to update my outdoor cushions but the prices I see in the stores are just too high for me to buy new ones. I will be trying your tutorial and sending you photos. Great tutorial! I really love the finished look on these cushions, youve inspired me,thank you! 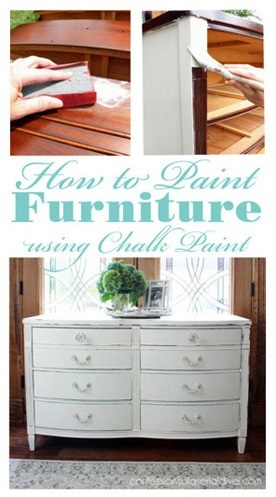 Love this tutorial!!! Thanks for sharing! 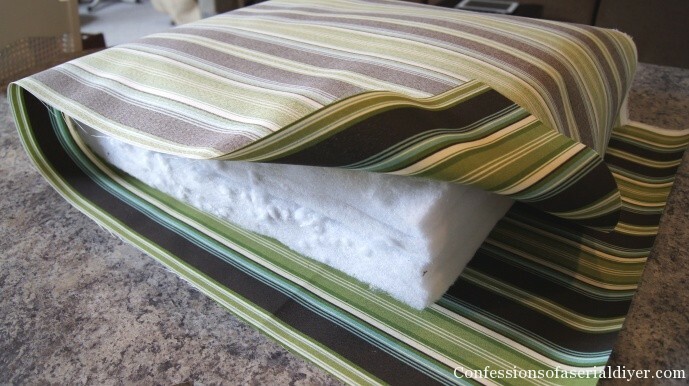 My cushions off curved at the top like yours that you show in the other tutorial. Do you think this exact method would work for covering those, without having to do a separate side piece like you show in the other tutorial? ok, thanks! 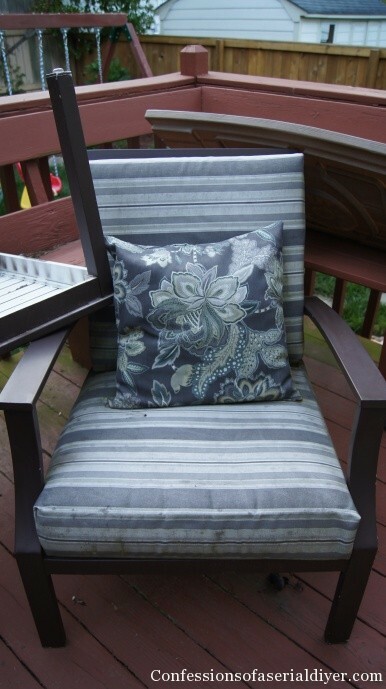 one last question…did you use upholstery thread since these will be outside and that kind of thread is rot proof? Thanks for the very helpful tutorial! 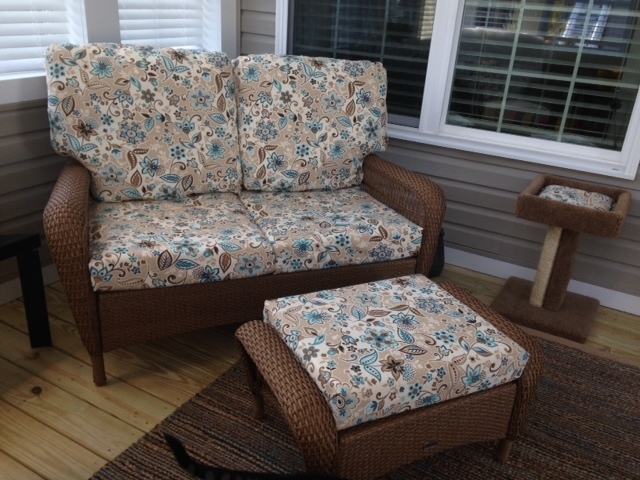 I tried to buy new outdoor cushions last year, but they are an odd size and nothing local worked. 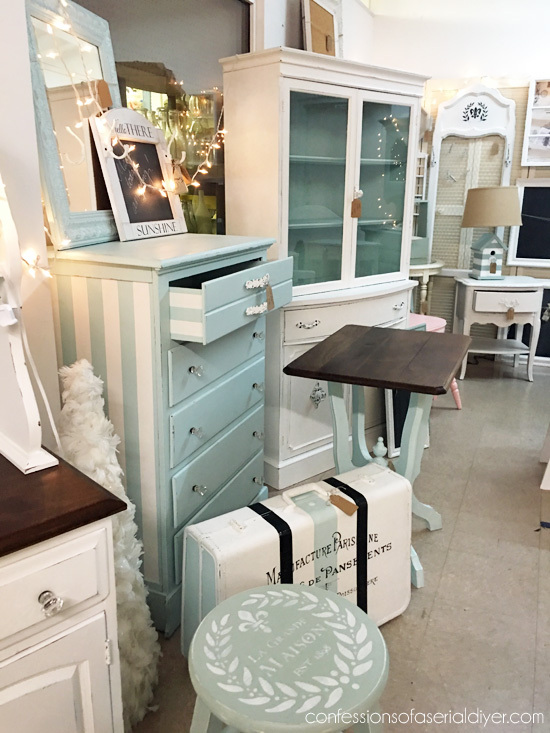 I started to catalog shop, but the prices were unbelievable. So, off to Joann Fabrics for a look at their fabric. I had them done in an evening and a morning. My husband has never seen me sew, so even he was impressed. 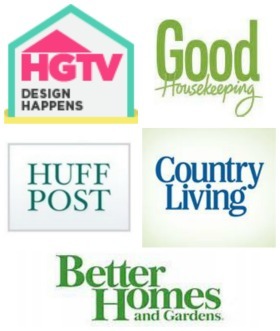 I just love the ideas and help we get online. Hello! I’m a newbie and have several questions. Most importantly, How do I know how much fabric to buy? Hi there! One yard is three feet, and since fabric is sold by the yard, I measured my cushions and then figured out how many yards I needed from there. 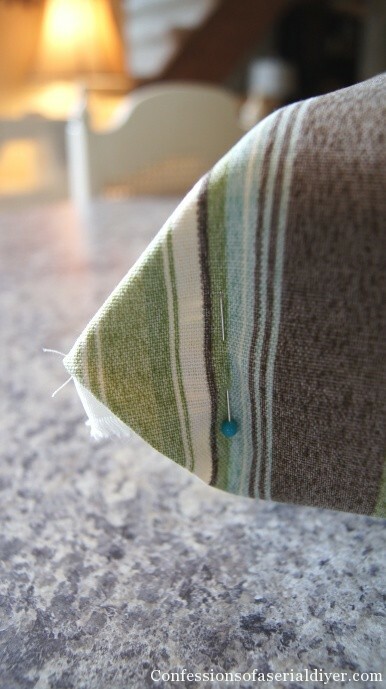 Your fabric will most likely be 45″ wide. Hope this helps!